There are those times when nothing but a fresh, crisp, healthy salad will do. You know those days-- when you've overindulged and need something light but delicious. 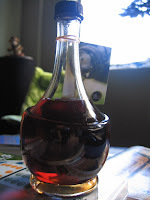 My friend Lesley picked up this fabulous Tomato Balsamic Vinegar for me and it came in handy on this day that I needed something ... fresh. This is a super simple salad, playing off the vinegar I wanted to add highlight that tomato portion of the vinegar-so I picked up roasted tomatoes at Whole Foods in their fresh olive section and I have to say they were fabulous! I was quite surprised. You can easily make your own, but not until tomato season. 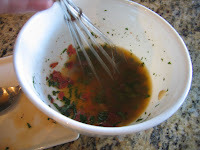 Be sure to pack some of the garlic slivers, capers and brine along with the tomatoes. There's thousands of salads and dressings out there and I make up new ones all the time. But not all are blog worthy, I felt this one is. 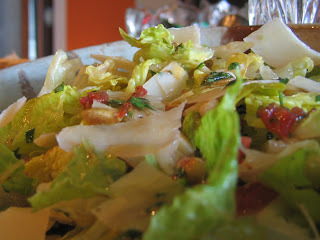 It's back to real basics with salad- not all the extras that can overwhelm. Give it a try! It's a great winter break and it will be even better in the summer! It's being fat and happy through the seasons. Whisk all the ingredients together, let rest for a minute. 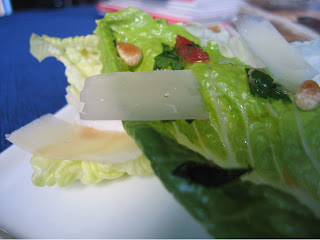 Toss with fresh romaine, toasted pine nuts and large peels of Romano cheese (or asiago or Parmesan would work too).